The Deadly Checkpoint That Divides Syria's Biggest City : Parallels While the U.S. debates its policy on Syria, many residents in Aleppo face the daily danger of crossing a checkpoint that divides Aleppo between government-controlled and rebel-held neighborhoods. 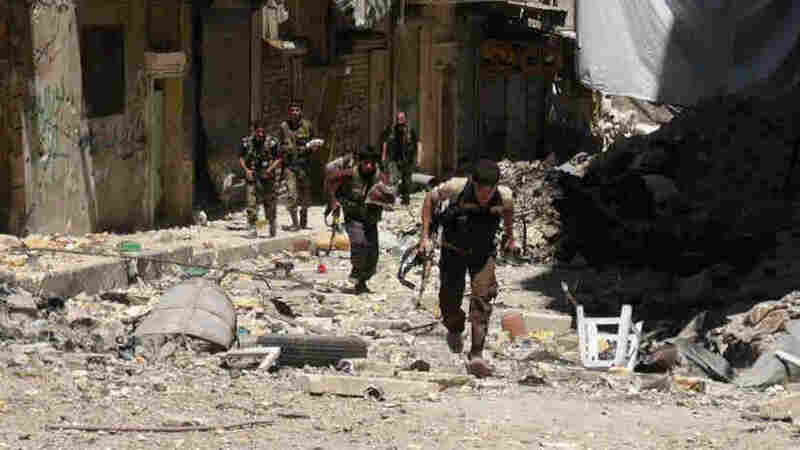 Syrian rebel fighters run run for cover during clashes Wednesday with government forces in Aleppo. Syria's largest city has been bitterly divided since heavy fighting broke out more than a year ago. The government army controls the western part of the city; the rebels control the east. Residents risk sniper fire as they cross back and forth. It's a typical day — which means it's a very dangerous one — at the Karaj al-Hajez crossing point that separates the eastern part of Aleppo that's held by Syrian rebels and the western part that's held by President Bashar Assad's army. Despite the risks, street vendors still shout about their merchandise on offer and residents carry on with their daily shopping. An old man urges his wife to hurry so they can cross back to the other side before trouble erupts, which it does with regularity. Suddenly, a sniper begins to fire and people start running and hiding behind walls or dashing onto side streets. The shooting gets heavier and machine guns join the noisy exchange of fire. People wait patiently until the shooting stops and the crossing point opens again, allowing residents to go home to the areas controlled by the government forces. This used to be a main road connecting two neighborhoods in Aleppo, Syria's largest city and commercial capital. But heavy fighting broke out in Aleppo more than a year ago. With the battle now largely a stalemate, Aleppo has been cleaved in two. And for more than two months now, this crossing on Karaj al-Hajaz street — which residents call the Death Crossing — has been the only point that links the two parts of the city. 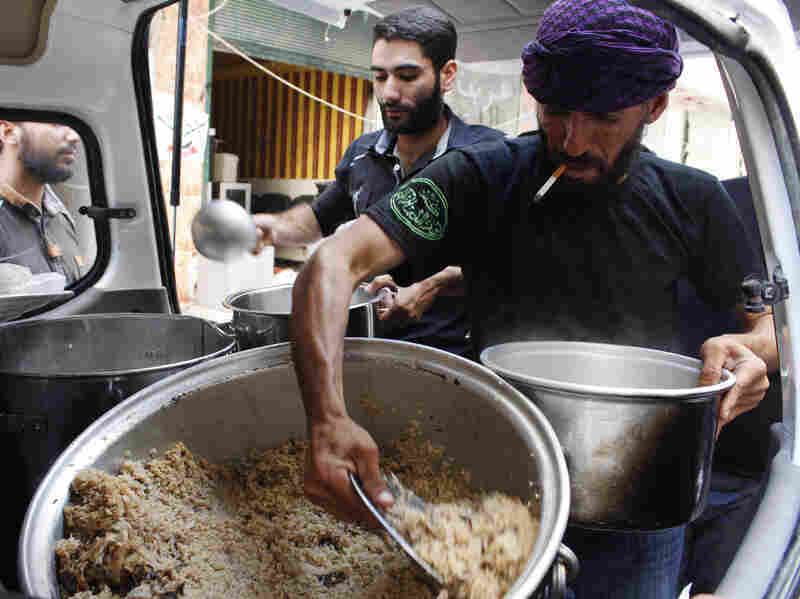 Rebels in the Free Syrian Army distribute food to fellow fighters in Aleppo on Wednesday. The government checkpoint and the rebel checkpoint are barely 100 yards apart. Thousands of people cross back and forth every day to work, shop, go to school and visit relatives. They complain that they risk arrest when they go through the government checkpoint and they sometimes face harassment or even kidnapping for ransom on the rebel side. "I have become used to going back and forth, and to the snipers," says a 25-year-old activist who asked that she not be named for safety reasons. "I have reached a point where I am more scared of getting arrested than being shot by a sniper." After graduating Aleppo University with an engineering degree in 2011, the woman planned to pursue her graduate studies abroad. Then the war intervened. She became an activist and found herself in charge of a school full of displaced families who fled the regime's shelling in their neighborhoods. As more of the city fell under rebel control, she found a reasonably safe place to carry out her work without worrying too much about getting arrested. She refers to the areas that have come under rebel control as a "new city," different from the old Aleppo and lacking services altogether. She works to develop the education system in rebel-held areas. Her group has launched two elementary schools and institutes for tutoring high school students. Residents try to find ways to predict when the snipers are most likely to fire, but it's impossible to know for sure. She believes it is better for her to cross during the morning rush hour or in the afternoon, when there are also large crowds crossing. 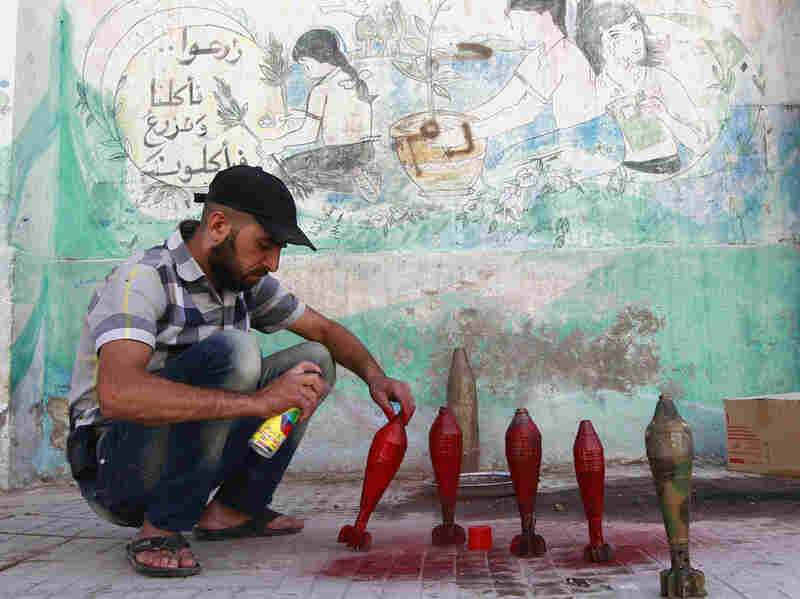 A rebel with the Free Syrian Army spray paints improvised mortar shells at a weapons factory in Aleppo on Thursday. "Although most of my friends have left the country I would say I am staying here as long as I am capable of working on my project and expressing myself," she said. "I am staying, and once I feel that things are out of control and I am not able to do anything, then I might leave." In addition to the possibility of being detained, Aleppo residents face the risk of being shot by pro-government snipers who are positioned in City Hall or other nearby buildings, including the al-Amir Hotel. Consider the case of Abdo, 23, an accountant. He works in rebel-held territory but lives in a government-controlled area. He can't find a job on the government side, and he can't afford to move to the rebel side because he doesn't have the money to pay rent. "The price of bread is 300 Syrian pounds [more than $1] on the regime's side and 65 on [the rebel] side," Abdo said. "Yesterday the [rebels] did not allow me to cross with bread so I will try again today." At the beginning of July, a highway into the city from the south was blocked and the airport closed. This situation created food shortages in the government-controlled areas of the city. For a few days, the rebels prevented residents from taking food and fuel into regime-held neighborhoods. Rebel commander Adnan al-Safi explained that prices soared in the government-held districts, so residents crossed to the rebel-held districts to buy food and other essentials. This created tremendous pressure on the crossing point. Activists held protests in front of a court to demand that they be allowed to cross back and forth. The rebels agreed to lift the ban, though they have limited the amount of food allowed to be transported by one person.